Bluff The Listener Our panelists read three stories about a wedding announcement that went viral this week, only one of which is true. Our panelists read three stories about a wedding announcement that went viral this week, only one of which is true. 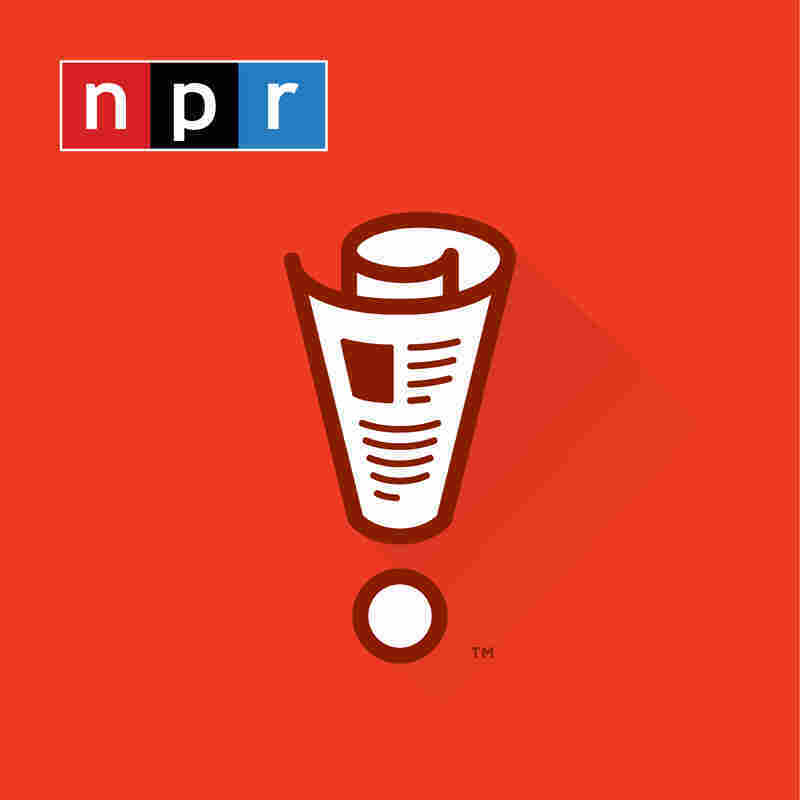 From NPR and WBEZ Chicago, this is WAIT WAIT... DON'T TELL ME, the NPR News quiz. I'm Bill Kurtis. We're playing this week with Janelle James, Alonzo Bodden and Helen Hong. And here again is your host at the Chase Bank Auditorium in downtown Chicago, Peter Sagal. SAGAL: Right now, it's time for the WAIT WAIT... DON'T TELL ME Bluff the Listener game. Call 1-888-WAITWAIT to play our game on the air. Hi, you are on WAIT WAIT... DON'T TELL ME. SARAH BRINKER: Oh, my gosh. Hi. SAGAL: It's OK. I'm a little nervous to talk to you as well. BRINKER: Hi. My name is Sarah Brinker, and I am from Effingham, Ill.
SAGAL: I've heard of Effingham. I've never been there. I have always assumed, being from this part of Illinois, that it got named when somebody said, that place - that effing (ph) ham. BRINKER: If you're coming down, you're going to see a big old cross along the way. You've found it. SAGAL: ...In Effingham, known, of course, as the big effing cross. SAGAL: Sarah, it's nice to have you with us. You're going to play our game in which you must try to tell truth from fiction. Bill, what is Sarah's topic? KURTIS: Here comes the brag. SAGAL: Newspaper wedding announcements - for when you're in love, and you need random strangers to know where you went to college. SAGAL: Well, we read a really interesting wedding announcement from a newspaper that went viral this week, and we thought we would share it with you. Each of our panelists are going to show you a wedding announcement. Only one of them is real. Kick that real one, and you will win our prize. You ready to play? BRINKER: Oh, snap. Let's go. SAGAL: OK. Here we go. First, let's hear from Alonzo Bodden. BODDEN: ...Who is now playing for the Arena Football League's Washington Valor after a career with the CFL Saskatchewan Roughriders and a brief stint with the NFL Detroit Lions, who cut him as if they could do better. BODDEN: ...So it looks like they'll be missing the playoffs and the wedding. We wish the couple love, happiness and an injury-free future in coaching once their playing careers have ended. SAGAL: Two athletes, a little bit frustrated but very good, get married in Oklahoma. Your next story of true love condensed into one paragraph comes from Helen Hong. HELEN HONG: From the Palm Beach Post, the bride, a graduate of the Fay School and Miss Porter's School, graduated from Georgetown University. She is a member of the Daughters of the Colonial Wars, the Society of the Friends of St. George's and Descendants of the Knights of the Garter and the Metropolitan Club in Washington, D.C. She is descended from the French count Guarin de Metz and the English baron Foulques Fitzwarenne, who was at Magna Carta. They were the subjects of the famous 13th-century manuscript, "The Romance Of Foulques Fitzwarenne." HONG: She was presented to society at the Infirmary Ball, an international debutante ball in New York City, Bachelors Cotillion in Baltimore, Queen Charlotte's Ball in London and was chosen to represent the United States at the Opera Ball in Vienna, Austria. She is director of the SPAM Museum in Minnesota. SAGAL: An American aristocrat, with deep roots in the gentry, runs the SPAM Museum in Minnesota. Your last story of someone announcing their impending matrimony comes from Janelle James. JANELLE JAMES: From the New York Times, Rafferty M. Grant (ph), a direct descendant of Robert E. Lee, and Lulu Gersh (ph), a New York socialite and heiress to the Lulumon (ph) yoga pant empire, are to be wed on May 26. The couple met while engaging in a shared passion - Civil War reenactments. JAMES: It was love at first sight for Mr. Grant, he said, when he spotted Miss Gersh charging towards him with a giant foam bayonet. JAMES: After a rousing battle on the field, the pair engaged in lively debate for and against the merits of slavery. After the ceremony, which will be held at the stately Drayton Plantation, the couple plans to honeymoon by reenacting the Battle of Fort Sumter one on one and staying at a South Carolina hotel in the romantic Ken Burns Fantasy Suite. SAGAL: All right. One of those is a real wedding announcement that had appeared in newsprint that we saw this week. Was it from Alonzo, a wedding in Oklahoma between two athletes who wanted the world to know that they were better than the world knew? SAGAL: From Helen Hong, a woman with extraordinary deep roots in American and European aristocracy who now works as the director of the SPAM Museum in Austin, Minn. - and from Janelle James, Civil War reenactors who met and fell in love on the battlefield? One of those was a real wedding announcement we saw on the news. Which do you think it was? SAGAL: They have strange ways down in Effingham. BRINKER: You know, I think Helen sold me her story. I'm going to go with Helen Hong. SAGAL: You're going to go with Helen Hong's story of the remarkable and aristocratic young lady who ended up running the SPAM Museum in Austin. That's your choice? SAGAL: All right. Well, we spoke to somebody about this very real wedding announcement. SHANNON DONNELLY: Here is this young woman with an incredibly long pedigree of - you know, certainly as long as your arm. And she has a job working for the SPAM Museum. SAGAL: That was Shannon Donnelly. She is the society editor for the Palm Beach Daily News for over 30 years. She was talking about the marriage of one Savile Lord, the aristocrat who now runs the SPAM Museum in Austin, Minn. Congratulations, Sarah. You got it right. BRINKER: Thank you, Helen. You were right. SAGAL: I should say this got a lot of attention for the reasons that you can tell. And in reaction to that, the SPAM Museum of Austin, Minn., says they are very proud of their director. And they invite everyone to visit to learn everything they've ever wanted to know about SPAM. SAGAL: Congratulations, Sarah. You've earned a point for Helen, and you've won our prize - the voice of anyone from our show on your voicemail. BRINKER: Yeah, baby. Thanks, Helen. You rock. TRACY BYRD: (Singing) I need something to brag about - a new car, a big, two-story house. I can't win her love without something to brag about.